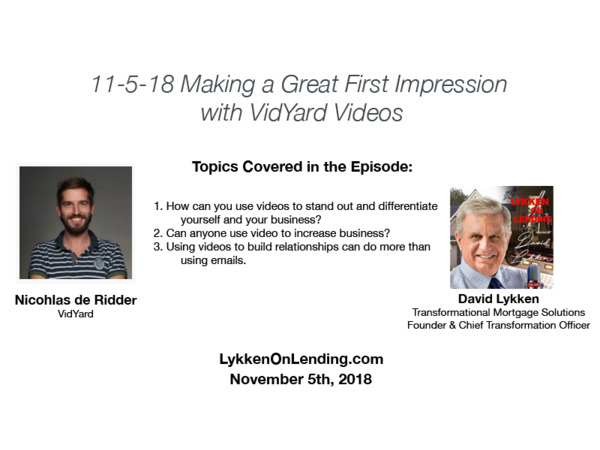 In this episode of Lykken on Lending, we have Nico (Nicholas de Ridder) from VidYard in our Hot Topic and we're looking at what is possible when it comes to making a first impression with video! Is your first impression something that makes you stand out? How can you help your customers connect with your company? Now that's a great first impression! Tune into the program today to hear more about how you can improve your profits with videos and VidYard! The first half of the program will start with an MBA Mortgage Minute from Rob VanRaaphorst and then we’ll have a TMSpotlight Soundbite from Les Parker focusing on his macroeconomic perspective on the economy with a music parody. Next up is Jacob Gaffney of HousingWire with the latest news and trends for the week. Then we’ll feature Joe Farr providing you a rate & market update, Alice Alvey of Union Home Mortgage providing a regulatory & legislative update followed by Allen Pollack giving us a Tech Report of the latest technology impacting our industry. Then Andy Schell, a/k/a “Profit Doctor” sharing ideas on how to improve your bottom line.